President Xi Jinping's official visit to Russia over the past two days proves once again that bilateral relations have a strong vitality in an uncertain period of an uncertain international situation. President Putin gave the Xi Jinping Medal of national service, and Xi Jinping said, "we agreed that the development of Sino-Russian relations will not be affected by any international change.". 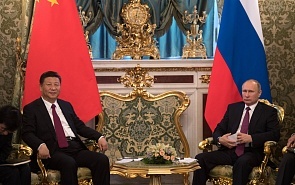 These unusual expressions fully illustrate the height reached by bilateral relations, and also demonstrate the strong foundation for the continuity of Sino- Russian relations. Why do Sino-Russian relations have such a strong and durable momentum? I think, first of all, because of the huge potential for cooperation between the two countries that are close to each other, as well as very strong consensus on the development of cooperation between China and Russia. With "The Belt and Road" going forward, we can feel and see enthusiasm of people from all walks of life for the development of cooperation with Russia, for deepening exchanges. This expectation comes not only from industry, trade and investment intentions, from cultural and educational circles, but, of course, also from millions of ordinary people, who want to see the great neighbors as real partners. The economic cooperation between the two big neighbors is not something that can be solved and done overnight. It is really a long and difficult process. Just like the border negotiations between China and Russia, that have been going through for forty years and which in the end resulted in a complete solution of the border problems between two countries. It is worth noting that the agreements reached between China and Russia during the latest visit of Presudent Xi to Russia have become the continuation of cooperation intentions and cooperation projects. For example, China's purchase of 20% stake in Rosneft indicates that Sino -Russian energy cooperation is gaining momentum, shows a new level of integration. China's total investment in the Far East is close to $2 billion 900 million, involving 26 projects, which will create 6000 jobs for Russia. This year, China Russia bilateral trade volume will rise to $80 billion..
What can be seen clearly is that the various mechanisms for economic cooperation between China and Russia are being pragmatically improved. In order to eliminate barriers to economic exchanges, the Chinese Ministry of Commerce and the Russian Ministry of Economic Development have set up mechanisms to cooperate in the search for these obstacles and barriers, and have identified many problems in various fields. China's most concerned investment protection issue will also be promoted through the establishment of the investment protection centre in the Far East. Regional cooperation between China and Russia is taking place not only in the Far East, but also in the Volga River basin and in the middle and upper reaches of the Yangtze river. The Chinese and Russian experts at my institute (East China Normal University - Ed.) have conducted field visits to a large number of Chinese enterprises involved in mutual cooperation. The next step will be to conduct field visits to Russian companies in order to effectively deepen cooperation. Dealing with bilateral relations in such a way should naturally be called a model of relations between great powers.